THE WESTERN Bulldogs will be looking to keep their undefeated season alive when they face the winless Adelaide on Saturday afternoon. With big wins over Fremantle (by 26 points) and the Brisbane Lions, the Dogs have already matched their 2017 victory tally. But in a blow, they’ll face the Crows without last year’s No. 1 draft pick Isabel Huntington, who ruptured the ACL in her right knee against the Lions, one week after fellow draftee Daria Bannister also suffered an ACL injury. Star midfielder Emma Kearney said the team had banded together and was expecting a fight from the Crows this weekend. AFLW Tipping: Can you pick this round's winners? 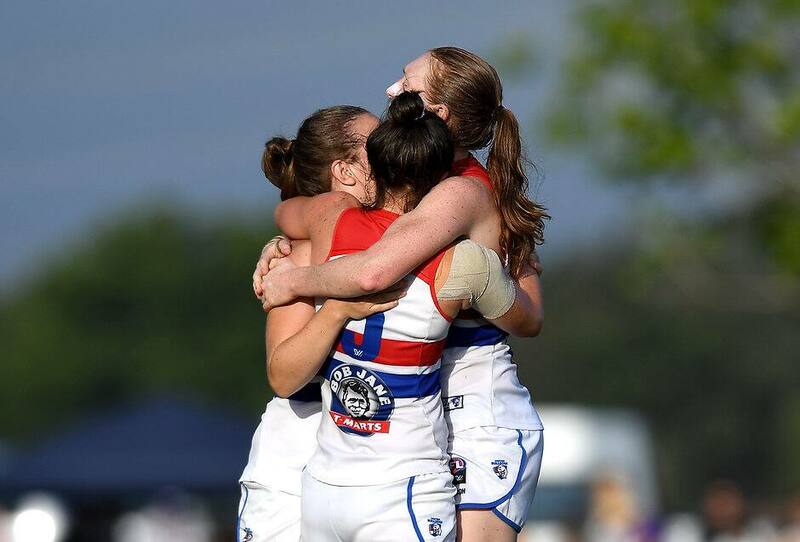 "It’s been quite devastating having those two girls go down with injuries in our games," she told westernbulldogs.com.au. "[Adelaide] were the premiers for a reason. We’re expecting a big, tough content. We’re up for the challenge." Former Demon forward Jessica Anderson was selected to replace Huntington and will play her first game for the Bulldogs. Adelaide has looked a shadow of its 2017 self this season. That could change with the inclusion of competition best and fairest Erin Phillips, who is due to play her first game of the season after overcoming a quad complaint. Unfortunately, the Crows will again be without All Australian defender Courtney Cramey (hamstring), while co-vice-captain Ange Foley will miss after accepting a one-week suspension for kneeing Melbourne captain Daisy Pearce. Coach Bec Goddard has backed under-pressure forward Sarah Perkins, who has failed to register a score this season after finishing second in the AFLW goalkicking award in 2017 (11 goals). "She has not had much service (from the midfield),” Goddard told the Adelaide Advertiser. "When the ball is in Sarah’s zone, she does something for the team. That is Sarah – a player who is desperate to do her best for the team. "Would I like her to be kicking goals? Yes. But I can’t fault her work for the team." Goddard swung three changes in search of a win, with forward Rachael Killian and debutant Marijana Rajcic joining Phillips to face the Dogs. Utility Sally Riley and defender Talia Radan (both omitted) will sit out with Foley. The only previous encounter between Carlton and the Brisbane Lions resulted in a draw. The match holds extra spice this time around, with Tayla Harris in line to face her old side for the first time since defecting to the Blues. Carlton sits undefeated atop the AFLW ladder after two rounds with a healthy percentage (226.1). Despite the strong position, inside midfielder Shae Audley said the team wasn’t thinking ahead, focusing only on the Lions this weekend. "It’s only two games (the season so far). [We’re] trying not to get ahead of ourselves," she told SEN.
"We’re looking forward to having Brisbane here. They’ve got some really good players [and] really good up-and-coming runners. "We’ll just have to make sure we’re on our A-game and shut them down where we have to." The Blues will be without captain Brianna Davey for the remainder of the season after she ruptured the ACL in her right knee during the final quarter against Greater Western Sydney. They have made two changes, recalling utility Katherine Gillespie-Jones and handing midfielder Katie-Jayne Grieve her debut. Defender Sarah Last (omitted) makes way, along with Davey. Brisbane will be hoping to bounce back after they suffered their first home and away loss in the competition’s short history last weekend. Injured defender and acting team manager Sam Virgo said the team was focused on Carlton and not simply former teammate Harris. "We have to focus on our game and on their entire team … not worry about one person because they’ll burn us on the other end," Virgo told Trail Blazers, AFL.com.au’s official AFLW podcast. "She’s an excellent player – our back five will have to work together to combat Carlton’s pretty impressive forward line. "We match up quite well against Carlton. They play a similar brand of footy to us – they’re pretty hard at the coalface and they like to spread and switch it. "It should be a cracking game." Forward Bella Ayre will run out with the Lions for the first time, having made the move from the Blues in the off-season, with young midfielder Gabby Collingwood omitted. Neither team has been able to secure a win in the opening two rounds, mirroring their efforts in the opening fortnight of last year’s season. Pies forward Christina Bernardi, fresh off 11 disposals and two goals against Fremantle, said the team was not performing to the level it could. "We are frustrated because we know we are better," Bernardi told collingwoodfc.com.au. "When we all work together – we can [play] a lot better. "We talked about the individual things we need to do properly to make our team stronger. "The little things – basic skills – need to improve." Maligned forward Mo Hope has earned a recall after being dropped in round two, one of three inclusions for the Pies. Ruck Ruby Schleicher and forward Meg Hutchins join Hope in facing the Giants, as key back Stacey Livingstone (shoulder), rookie Holly Whitford (omitted) and ruck-forward Eliza Hynes (omitted) sit out. The Giants took it right up to premiership fancies Melbourne (losing by six points) and Carlton (21) in the opening two rounds. Coming off a one-win season last year, honourable losses are not enough, with the Giants keen to have their ladder position reflect their improvement. "A close loss isn’t really good enough for us," star midfielder Emma Swanson said. "People are saying we’re coming out and playing better than we did last year, but that’s not really good enough. "We’re here to win games of footy now." Key position player Louise Stephenson and small forward Jodie Hicks have been brought into the Giants line-up, with ex-Demon Maddie Boyd and defender Renee Tomkins omitted. Undefeated Melbourne travels to Perth for the last game of round three. Despite a scare against Greater Western Sydney in round one, the Dees made light work of a disappointing Adelaide last week. The Demons have consecutive away games, with a trip to Alice Springs to play Collingwood awaiting them after the Fremantle game. Star forward Lily Mithen said the trip would further bond the players. "We’re still not playing our best footy, which is exciting," she told melbournefc.com.au. "It’s going to be really nice to get away – we will really gel. "To get back on the road…will be a positive for our group." The Dees have made one change, recalling defender Jasmine Grierson at the expense of forward Alyssa Mifsud. Fremantle is looking to build momentum heading to the mid-point of the season after winning its first game, against the Pies. The Dockers will have to get the job done without key forward Stacey Barr, who accepted a one-week suspension for striking Collingwood’s Chloe Molloy. Brianna Green, a late out before the Magpies game, ruptured the ACL in her right knee at training last week and will miss the remainder of the season. Despite the absentees, expect Fremantle to turn the heat up on Sunday. "Our tackle pressure is really something the we want to focus on," star defender Ebony Antonio told fremantlefc.com.au. "That’s something we want to be known for." Emily McGuire, 19, will make her debut against the Dees, replacing the suspended Barr.